Beijing faces overcrowded roads and pollution that are constantly getting worse. Why? According to city officials, it’s because of ride-sharing services, including Uber. The Wall Street Journal is reporting today that local governments around the Chinese capital are none too pleased with the huge spikes in popularity of companies like Uber and Chinese ride-sharing service, Didi. On Monday, Beijing officials claimed that web-based car-hailing apps have added over 100,000 private vehicles to Beijing streets, which run between 600,000 and 700,000 trips per day. According to them, that’s “exacerbating road congestion” in the already traffic jam-plagued capital. China has a complicated relationship with cars. The middle class is getting bigger and cities are spreading, so more people want to buy vehicles. At this point, China’s car market is even bigger than America’s. Beijing alone has 5.6 million vehicles on its roads. Problem is, China’s notoriously bad air quality is killing up to 4,000 people a day. Chinese are left with few alternatives to buying autos of their own, though, since China’s development of new public infrastructure hasn’t kept up to speed with its increased urbanization. Still, Uber and Didi have apparently done little for nightmarish traffic. 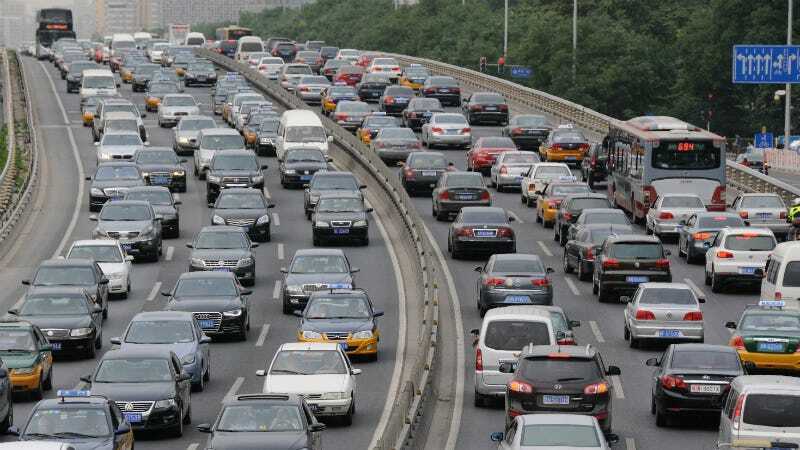 A survey released last Tuesday by Chinese online map maker AutoNavi revealed that a drive in Beijing that should take a half hour still takes over an hour. Pollution, too, is only getting deadlier: Last month, Beijing issued its first-ever “red alert,” in which the smog was so bad that the city temporarily banned half of Beijing’s cars from city streets. Unlike a lot of other tech companies, from Google to Netflix, Uber’s succeeded in breaking into the heavily regulated Chinese internet market by teaming up with Chinese companies, like airline operator HNA Group, auto manufacturer Guangzhou, and China Life, the country’s biggest life insurance company. Since it launched in February 2014, Uber China has grown at a spectacular rate and is already valued at $7 billion. So the country’s Uber issues aren’t getting any simpler anytime soon.